Biafine cream emulsion is a topical non-steroidal cream for treating burns, wounds and irritations. The clinical benefits of Biafine to stimulate all phases of wound healing have been studied in the United States prior to U.S. Food and Drug Administration approval in 2006, and these benefits underscore the heritage of the product's use in France for over 25 years. Biafine contains non-toxic ingredients in an herbal base and its use includes burn dressings, post-treatment for cosmetic and plastic surgery and dermatology treatments (such as sunburn). Significance Biafine is manufactured by Laboratoire Medix in France as a topical for wounds and burns. Biafine has been used in France for more than 25 years, and it contains non-toxic and herbal ingredients. It was approved in 2006 for use in the United States. Biafine hydrates skin tissue, adding water to healing tissue, softening scars, promoting the body's antibacterial activity and reducing contamination. It is safe to use Biafine daily. Function Biafineis a topical, water-based emulsion that penetrates the skin to hydrate the underlying tissues. The formulation is an emollient, which softens scarred and dead superficial tissue upon penetration and hydration, to promote healing. Biafine enhances autolytic debridement, which is the body's mechanism to eliminate dead tissue as part of the healing process by enhancing macrophage recruitment to the wound site. A moist dressing and increased macrophage recruitment for natural healing reduce the need to remove dead and scarred tissue surgically. As an emulsion, Biafine also provides a barrier similar to hydrogels which protect the wounds against further bacterial contamination. 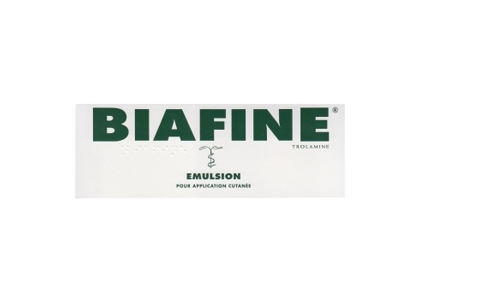 Approved Indications Biafine is used to treat burns, skin irritations, superficial wounds and dryness. Its popularity overseas has been for its hydrating properties and effectiveness on sunburned skin and scrapes. Clinical studies were conducted in the United States for burns, wound healing and radiation. According to the Biafine package insert, the FDA has approved Biafine for use in full thickness wounds, pressure sores and dermal ulcers (includes lower leg ulcers), superficial wounds, first- and second-degree burns, sunburns, dermal donor and graft site management, radiation dermatitis and minor abrasions. BIAFINE contains purified water, liquid paraffin, ethylene glycol monostearate, stearic acid, propylene glycol, paraffin wax, squalane, avocado oil, trolamine/sodium alginate, triethanolamine, cetyl palmitate, methylparaben (sodium salt), sorbic acid (potassium salt), propylparaben (sodium salt), and fragrance.